Although a small Club we aim to support a wide range of needs in our community over time. We have long-standing links with . We regular visit the school's pupils, and fund various pieces of equipment and Xmas gifts. The highlight of our year is, of course the Xmas party with father Christmas. The Stevenage Clubs also fund & accompany teachers and carers from Lonsdale, Greenside and Larwood schools on Rotary's annual Kids Out day to Whipsnade Zoo. With the help of a matching grant from our Rotary District the Grange donated £1,800 to Greenside school to purchase two interactive bubble tubes for their refurbished sensory room. Working with schools and youth organisations we encourage local students to demonstrate their growing skills in one or more development opportunities. Our Clubs organise or support a range of local heats for our National competitions sponsored by Rotary in Britain & Ireland (RIBI). Click on a logo to find out more or contact Iola Samuels locally. Working with the RAF, we invite [and fund] leaders and potential leaders to enjoy a RYLA weekend at RAF Henlow. RYLA is a training program for those aged between 14 and 30. It provides a memorable opportunity to learn, grow, have fun & make new friends. 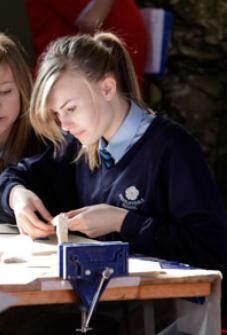 We have supported schools' PSHE programmes by sponsoring Rotary's CD Rom programme on drugs, bullying & other issues. We sponsored two students at the Fusion Performing Arts Youth Festival. In association with the BBC News Channel The RIBI Young Citizen Awards showcase and celebrate the positive citizenship and important responsibilities assumed by many young people under the age of 25 in their communities. 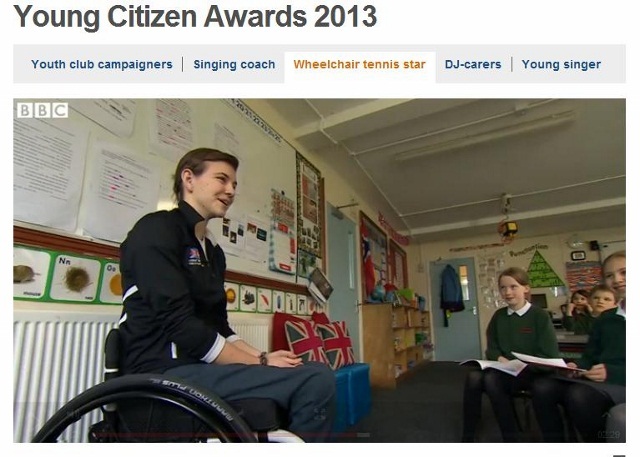 In addition to being awarded £500, winners are interviewed live at the RIBI Annual Conference for the BBC News Channel. If you are exceptional, or know of someone who is, do have a look at this years inspiring entrants by clicking on the video picture (left) and contact us, here at RC Stevenage Grange. We have funded and taken elderly people on our 'Seniors Out' outing. Stevenage Club funds & distributes Christmas parcels in the Town. The Grange supports the Town's ShopMobility scheme. In May 2005, Stevenage Club inaugurated 'Lend a Hand Day': They together with the Grange spend a day doing odd jobs for the elderly and infirm. The latter initiative has since been taken up District wide. We run events and provide support for The North Herts Hospice, The Garden Hospice, Macmillan Nurses and others. 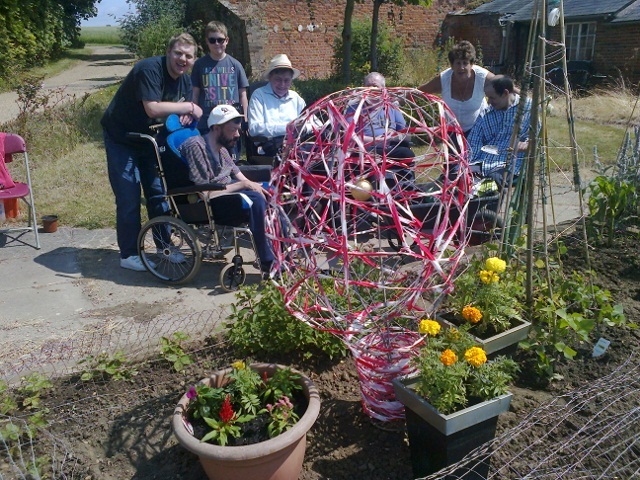 Recently John O'Conner, a Grange Member, arranged for his Company to undertake and fund a make-over of their Sensory garden. Earlier John's staff and and their families volunteered to provide and plant a range of spring bulbs. The Grange also designed & installed The Wishing Well at the Lister Hospital which raises £1,000 p.a. From its foundation in 2000, the Grange physically helped develop, and continues to support the 'Living Room': A churches together based charity, who's successfull concept is being developed elsewhere. It provides counselling and support for people of all ages and circumstance debilitated by drug, alcohol, substance or other abuse. Janis Feely, its founder was awarded the MBE in 2010. She subsequently received Rotary's highest honour as a Paul Harris Fellow. and in late 2013 was invited to 10 Dowing Street, as finalist in the British Gas sponsored "Inspirational Women of the year". Our congratulations go out to Janice for the recognition she rightfully deserves. Well done Janis. We're proud to be associated with you. 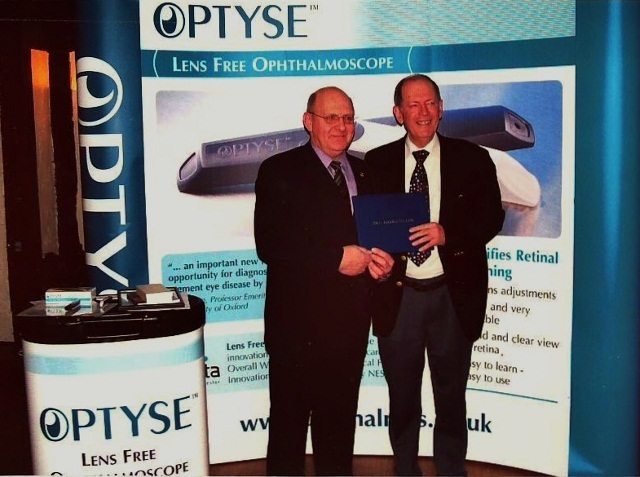 From 2003 to its launch in January 2006, Grange Members actively encouraged, provided commercial advi se and supported the potential development of a sight saving invention, a lense free ophthalmoscope called 'Optyse'. It was pioneered by retired Lister Hospital Surgeon, Mr Roger Armour. The Club purchased 1,500 Optyse units which were sent, free of charge through SightSavers International and other charities to countries throughout the world. Today they are being used commercially in places as far apart as the USA & Camp Bastion in Afghanistan. In January 2006, the Club launched the Rotarians Ophthalmic Initiative (ROI) now known as Making Blindness History to examine, treat eye-disorders and fund eye care equipment. So far we have raised over £230,000 to save sight for over 7,600 people. Learn more about this under International. 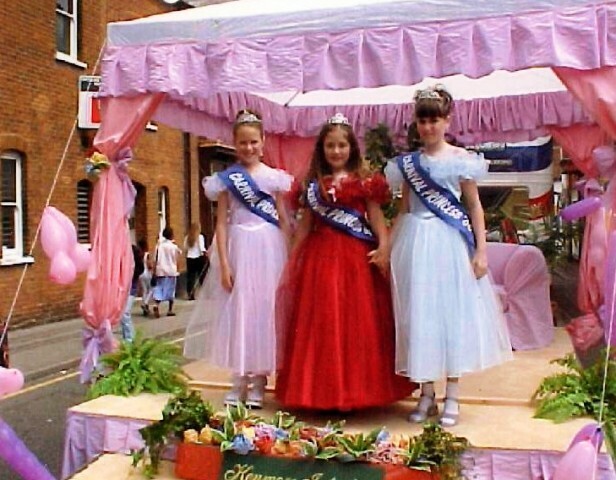 Stevenage Carnival was run by Rotary since its inception in 1962 until 2003. In the last 10 or so years, Carnival raised over £100,000 for the benefit of people with disabilities in the local community. At today's prices, since it began, some £1/4m has been distributed to over a hundred local groups. Carnival was followed by Sounds from the Street in 2004. Given insurance & other logistical challenges no new Town wide, street based activities are currently planned. 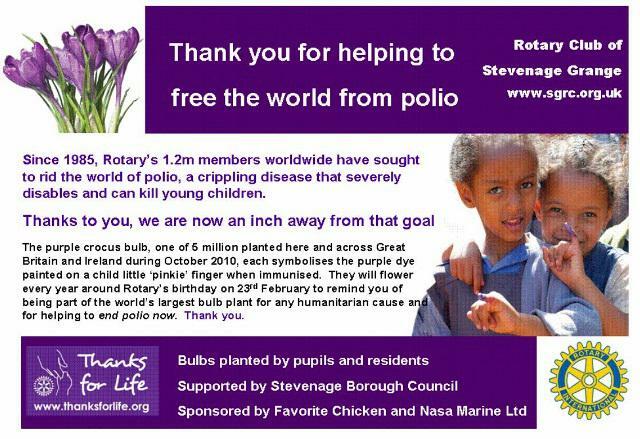 Was run by the Stevenage Rotary Clubs since its inception in 1962, until 2003. In its last 10 or so years, Carnival raised over 100,000 for the benefit of people with disabilities in the local community. At todays prices, since it began, some 250,000 has been distributed to over a hundred local groups. Carnival was followed by Sounds from the Street in 2004. Given insurance & other logistical challenges, regrettably, no new Town wide, street based activities are currently planned.